tempmate.®-i1 indicators use 3 built-in LEDs to directly show you the current alert status. tempmate.®-i1 indicators use 3 built-in LEDs to directly show you the current alert status, meaning that no other software or hardware is necessary for you to be able to see the status of your goods. Worried about your cold chain? tempmate.®-i1 constantly monitors all relevant values. tempmate.®-i1 indicators have been specially developed for monitoring pharmaceutical products’ cold chain. As a pre-programmed device, the tempmate.®-i1 can be immediately deployed for monitoring temperature-sensitive goods and freight. In contrast to chemical indicators, this electronic indicator’s 3 LEDs provide simple, clear feedback on the current condition of your goods. How long can the tempmate.®i1 indicator run for? Its maximum life is 180 days. What’s the best before date? The BBD date is 4 years in the future! Can I use it in the same way as the tempmate.®-S1 radio data logger? The technical elements are similar, but for cost reasons, its functionality is restricted. If you don’t require a detailed PDF report, the indicator can also be used as a standalone solution. It can also be used in conjunction with the tempmate.®-S1 data logger, in order to provide various PDF reports on different aspects of your delivery. Can I generate a PDF report? The indicator provides you with a status report using only the built-in LED indicators. There is no readout function for the PC. Does the indicator have a memory function? 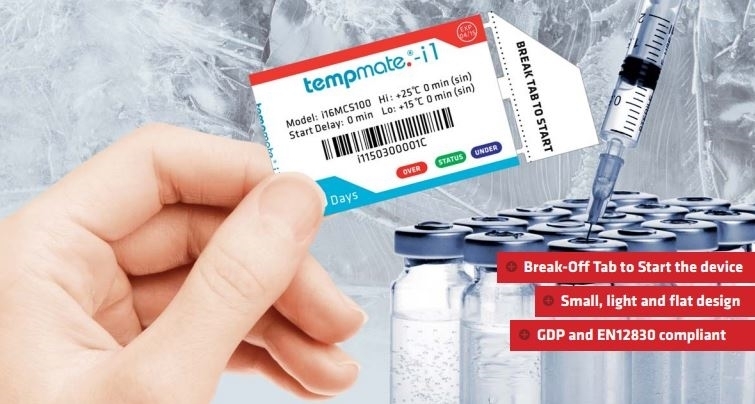 The tempmate.®-1 stores the extreme values (the highest and lowest temperatures). In the event that the upper or lower temperature thresholds are breached, an alert is triggered.